Samsung Galaxy S8 is now officially the most anticipated smartphone of 2017. The numbers are backing up the Korean giant claim that it’s the best thing coming in a long time. Many also believes that it is the best smartphone for businessman’s – who previously prefer Apple’s iPhone instead of Galaxy models. Did the game just changed in one year time? The answer of this question is YES. It’s been long time since the Apple has come up with something that captures the attention of the whole world. And now Korean giant SAMSUNG has capitalized on the opportunity even after a disastrous last year – when their leading smartphone model failed because of battery explosion issues. The Samsung Galaxy s8 models will be available in Stores this week and pre-order of more than 728,000 units has proven that people are eagerly waiting for its availability. Samsung Galaxy S8 and s8 Plus are the best smartphones of 2017. There will be no argument that Apple’s best iPhone models not even close to what their biggest competitors are offering to the public and Businessman’s. 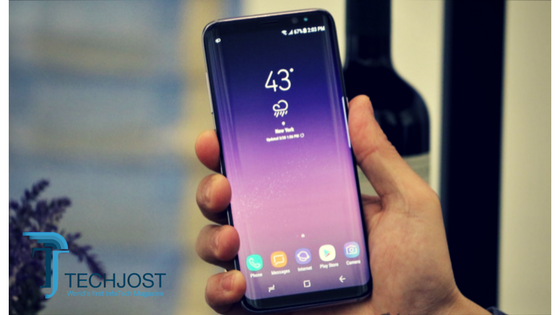 I’m presenting the top 5 reasons – Why you should spend the money on Samsung’s Galaxy S8 model instead of any other smartphone available in the market (including iPhone 7). The one of the biggest and most attractive feature of Samsung Galaxy S8 model is the astounding display feature. It’s curved side display has grabbed the attention of everyone since its unveiling in March. The Galaxy S8 Plus model comes with a 6.2 inch display screen with “no side bezels” and very slight top and bottom bezels. When you compare it with iPhone 7 Plus model its much slimmer and iPhone 7 plus model screen size is also 0.7 inch smaller (5.5 inch). Basically, Korean giant has beaten the market leader of US Market in every aspect of display and size. The second biggest attraction in Samsung S8 models are how they are built. Galaxy s8 model is coming with Gorilla Glass 5 on both front and back. It’s designed in such a way that, it will have protection from 1.6 inch height drop – Means if you drop your S8 plus from shoulder height it will not break. Apple iPhone 7 models also has a glass on front but the backside is metal so, Galaxy s8 models will be much more smoother when you compare them with iPhone 7 models. The Apple’s finger security feature is now the thing of past. Samsung Galaxy S8 is now introducing multiple security features including facial recognition. Now you can unlock the phone via your facial recognition if you desire. You can also choose from other security options such as; finger print security unlocking feature, a pattern, password or even the passcode. There are so many security options available in Samsung Galaxy s8 that it feels that it provides a complete sense of security. We all know that; security is now a critical thing for every person and these feature has proven that Samsung is taking their users security very seriously. Samsung pay is much advanced and provides support in many more stores and retail locations; when compared with Apple Pay. You’ll be surprised because there are many retail stores in U.S that may accept the Samsung pay even though they don’t accept wireless payments. The company is adding more banks regularly and introducing different promotions every now and then to encourage the Samsung users to switch towards Samsung Pay. The Galaxy S8 models with feature Bluetooth 5.0 – Which enables a user to connect two or more headphones at same time. It’s the most advanced Bluetooth technology, which not only improved the performance of Bluetooth connectivity but also increase its range. Bluetooth is one of the highly desirable feature because of cars, smartwatch and increasing number of IoT (Internet of Things) everywhere. Any tech related product we buy it’ll eventually connect with our Smartphone. Which makes it extremely important that smartphone should have a strong Bluetooth connectivity. This is one feature Apple hasn’t even considered of providing to its customers when planning for iPhone 7 models. Even though iPhone memory limit is 256 GB compared to S8 models of 64 GB but, the microSD feature is there to cover it up. You can insert as many cards in and out and sometimes this feature is extremely useful in emergency situation. when there’s no pen-drive around you. I personally like a SD card feature because you can Put those cards IN and Out according to your need and they are also pretty cheap. For further updates on Galaxy S8 keep in touch with us. We will be covering it throughout this month.